R.Gos might be the staple to pop culture just as much as OCBDs are the staple to a business casual wardrobe – and we’ll hedge our bets on this being a factor in his praiseworthy style. 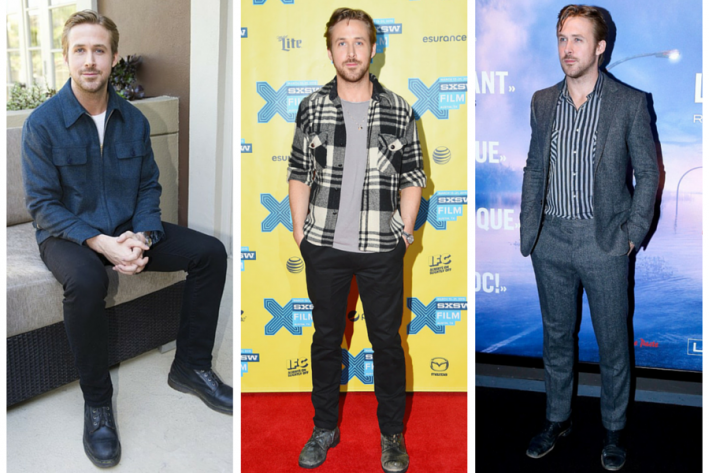 Gosling has seemingly stumbled upon a personal style that’s utterly accessible yet begs reactions akin to “huh, how did I not think of that?” when it comes to his unique outfit combinations. While my mind directly reverts to his role in Remember the Titans (shout out to Remember the Titans being made) where he dons an all-American preppy persona, it’s fascinating to see how his style has subtly changed over the years enough to make an undeniable impact on how he’s perceived. The takeaway here: small changes make a noticeable difference. Nikolaj (besides being genuinely fun to type) is definitely hot on the Hollywood scene, but he’s no stranger to dressing to the nines. Much like many of the European men that makes waves here style-wise, his eye for properly fitting clothing positions him as a standout choice for any style related competition. Here at SG HQ we know you guys favor a classic aesthetic – and we can’t say we disagree – because it works. Nikolaj can look just as appealing in a chambray shirt as he does in a designer tuxedo and when it comes down to it, isn’t that why embracing timeless style is so great? We sure think so. Let’s mark it: one week after this competition started, “binge-watching” doesn’t seem to accurately describe what was done to season one of Mr. Robot. It was more so a single-breath inhalation in an undisclosed period time (cough cough, two days). Enthusiastic interest in his breakout role aside, Rami Malek keeps his style updated but minimal which is a strategy that can be applied to anyone’s wardrobe. If your go-to staples are cut to properly fall on your frame, it’s easier to play with trends in the form of pattern, color, and even footwear. Oh – and he can rock an invisible tie like no other. Another success story in both talent and timeless style, Jon Hamm’s ability to command even the most edgy of competition (flashbacks to Justin Theroux) exemplifies the strength that comes from sticking to clothing works for you. Here’s the thing: we’ll most likely never see Hamm in a pair of drop crotch joggers, but his wardrobe never looks dated either – and that’s because he has mastered the mix of trendy accessories and classic tailoring for consistent looks that are always interesting.